Quick No-Bake Sugar-Free Peanut Butter FUDGE! No-Bake Sugar-Free Peanut Butter FUDGE! We’re all trying to eat healthier these days. But c’mon – you can’t live your life eating nothing but rice cakes and tofu. You’ve got to keep those taste buds entertained from time to time! Recently guest writer Ashley shared her experience of going through a full month without any refined sugar at all. WOW! But her hubby loves sweet treats so how will she help him stay on track during this long challenge? She did lots of research into ways to enjoy sweet treats without buckling in their sugar-free quest. 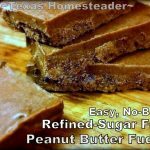 On her post sharing Week THREE she shared a recipe for a delicious Sugar-Free Peanut Butter Fudge that has the added bonus of being no-bake. What a perfect combination on a hot summer’s day. You’re NOT gonna want to miss this – check it out. TAMMY’S NOTE: This No-Sugar challenge documents Ashley’s 30-day attempt to remove PROCESSED SUGAR from their diet. This challenge allows her to use natural sugars such as fruit, honey or true maple syrup. Therefore it’s not meant for a diabetic alternative, simply a personal-health challenge. …from Ashley: I don’t want to take credit for being creative enough to have created these from scratch. I have researched ways others have made sugar-free desserts and modified different ingredients to my own tastes. I just cannot pinpoint the exact starting points for these recipes. Mix all ingredients, except salt, in a large bowl until all chunks are gone. Line a baking pan with parchment paper and pour mixture into the pan. Finally, cover and leave in refrigerator until completely firm. When fudge is firm, cut into squares and sprinkle with salt. Enjoy. NOTE: This fudge softens as it warms, so it's best stored in the fridge and enjoyed while still cool. This entry was posted in Blog Posts and tagged Cooking, Frugality, Make-It-Yourself, Recipes, Summer on December 6, 2015 by Texas Homesteader. Good morning! Just a little note to let you know this post has been FEATURED today at the Art of Home-Making Mondays at Strangers & Pilgrims on Earth. Thank you for joining us! I didn’t realize fudge could be made sugar free! Wow!! 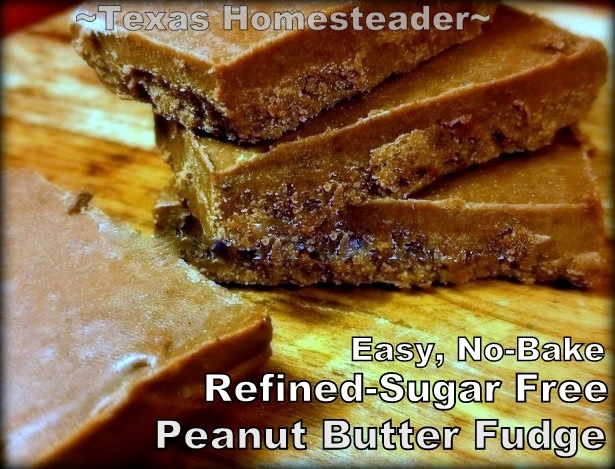 A no sugar fudge…That’s impressive! Thanks for sharing on My 2 Favorite Things on Thursday! See you again tomorrow! Pinned! I’m a big fan of fudge and a sugar-free fudge that’s easy to make too certainly fits the bill for me. Thanks for the pin Elaine. Thx for the great recipe and for participating in the blog hop. I’m going to try this one.